How many of you are virgins? How many of you are on Tinder?” asks chef Gaggan Anand, who at 39 and on his second marriage, is no virgin—neither as a man nor as a chef. There is a titter of laughter from the waitstaff—stiff and formal in their black suits and bow ties. It is 6.30pm. There is that lovely hush that descends on a restaurant before the dinner service, like a theatre before the curtain goes up. Clad in a black T-shirt and jeans, Anand is working at a frantic pace with his waitstaff. In 1 hour, 40 guests who have paid Rs16,500 per head for the pleasure of tasting his food will arrive for a candle-lit feast at the Masala Klub at The Taj West End in Bengaluru (I attended as a guest of the Taj). Anand is in the city for “Culinary Trails by Taj”, an ongoing initiative where the Taj group invites star chefs to India to showcase their talents at “pop-ups” across Indian cities. Anand’s four-city tour (Delhi, Mumbai, Bengaluru and Chennai) of India finished earlier this month. “This is the most beautiful venue among all the pop-ups that we have done,” says Anand, nodding at the long communal table that is laid out in the restaurant’s garden. Candles flicker. Wineglasses stand like empty sentinels. Low-lying flower arrangements punctuate the table. Tellingly, there is no cutlery—Anand wants diners to eat with their hands, Indian-style. The black-clad waitstaff stand around Masala Klub chefs in their spotless whites. Anand’s personal entourage of seven—five chefs (from Peru, Spain, Japan and India), his Serbian sommelier and his publicist—have gathered around him. He tries to get his staff to relax and spells out the rules at the same time. Anand delivers clichéd, if inconsistent, homilies in rapid succession. Then again, “a foolish consistency”, as Ralph Waldo Emerson said, is the “hobgoblin of little minds” and not the hallmark of a gifted chef who likes to talk, loves chaos, hates repetition, venerates culture, values identity, gets bored easily, and—save for his beer belly—has the slouchy demeanour of a tall teenager still coming to grips with his success. 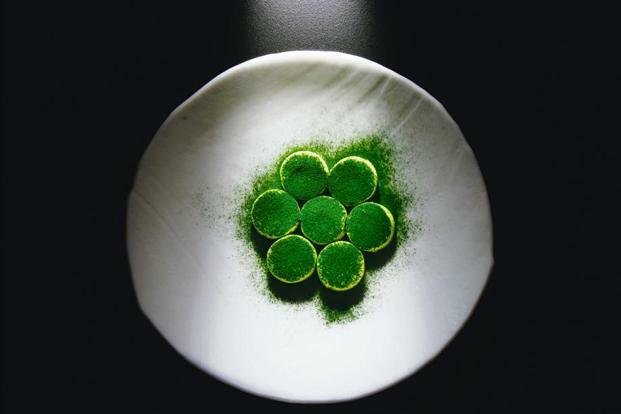 Earlier this year, his eponymous restaurant, Gaggan (which he started in 2010 in Bangkok, where he is based),was named No.7 in The World’s 50 Best Restaurants list, below Central in Lima, Peru, but above Maido, also in Lima. Peru is the pilgrimage destination of every foodie these days. 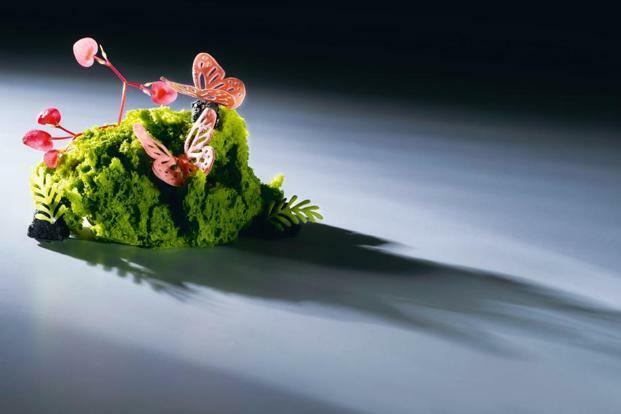 Gaggan beat Arpège in Paris, Mugaritz in Spain, and Le Bernardin in New York. This is a big deal. Anand could well be the Ferran Adrià of Asia, a comparison he won’t wince about given he idolizes the Catalan chef. Today, his burgeoning business includes investments in other restaurants—together they have an annual turnover of $18 million (around Rs117 crore). Anand is feted and invited by chefs and food event organizers worldwide. Along with his fame, his social media presence and style quotient have increased. He has been visiting Japan every month since the time he shifted his base to Bangkok in 2007; he admires its cuisine, and turns to all things Japanese for his personal wardrobe: clothes by Yohji Yamamoto, Sacai, Issey Miyake and Comme des Garçons, Dita glasses, and Onitsuka Tiger shoes, of which he owns over 90 pairs. But he prefers Swiss watches—Corum Bubble and HYT. “Gaggan Sir, smile please,” say the photographers hovering around. He turns to them and bares his lips into a toothy grin obediently. It is reminiscent of his Instagram feed, full of laughter, singing and much drunken revelry. Indeed, he began his restaurant after one drunken miserable night, he says. Today, the dish that Gaggan spends most of his time on is called “Lick It Up”. He wants the diners to lift up their plates and lick the pea and mushroom mash clean, “like we did as kids”. When the dish appears, it looks like baby food: a green and brown streak of mash atop which is the phrase in red: “lick it up”. “If anyone uses their fingers, tell them to stop and simply lick the plate,” Anand instructs the waitstaff. The timing also has to be perfect. Gaggan will play a song by the American rock band Kiss. Just when the chorus begins “Lick It Up”—the plates will be set down in front of the diners, who will presumably follow the song’s instruction. Later, at the table, I witness this synchronized service in action. It is the fourth course in a 19-course menu. The first three courses have been stunning. My favourite so far is a yogurt spherification, popularized by Adrià at elBulli, where Anand staged (unpaid cooking internship) early in his career. Spherification is a favourite trick of molecular gastronomists: a pinch of sodium alginate powder followed by a dunk into cold calcium chloride solution causes food to freeze like egg yolk inside the white. Gaggan’s yogurt ball wobbles as we pop one in the mouth and then explodes like a gol gappa, except that this version is more subtle, inventive and playful. As the 40 diners watch, Anand introduces the dish which he has named Yogurt Explosion. It is the dish that brought him great fame. 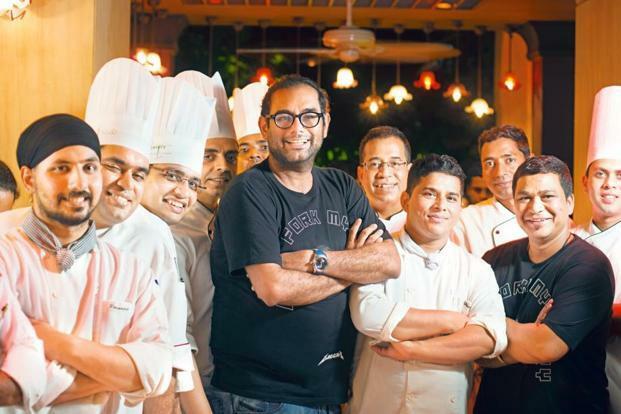 “When I close Gaggan (the restaurant) I will serve this dish on the last day,” he tells them. Yogurt will be part of his “last supper”, which should warm the cockles of every south Indian who thinks curd rice ought to be the proper end to a meal—or a restaurant. Anand has also been influenced by Japan’s culinary purity and minimalism. “Get rid of garam masala,” he says. “Don’t do ginger-garlic paste. Use ginger or garlic.” Brahmin vegetarian cuisine across all the south Indian states epitomizes all these tenets of simplicity. Anand loves Kerala thorans (vegetables lightly sautéed with grated coconut and green chilies), having studied at the Institute of Hotel Management and Catering Technology in the state. Indeed, simple south Indian dishes may be the next frontier for inventive chefs. Indian cuisine may well be among the greatest cuisines in the world, but not the version that is served in our restaurants, where the ingredients are doused with sauce to the point where nothing stands out. Anand takes his inspiration from Kerala, where he trained, Bengal, where he grew up, and Japan, where his spirit belongs. Anand has already figured out his signature style. But even the best in the business get bored. 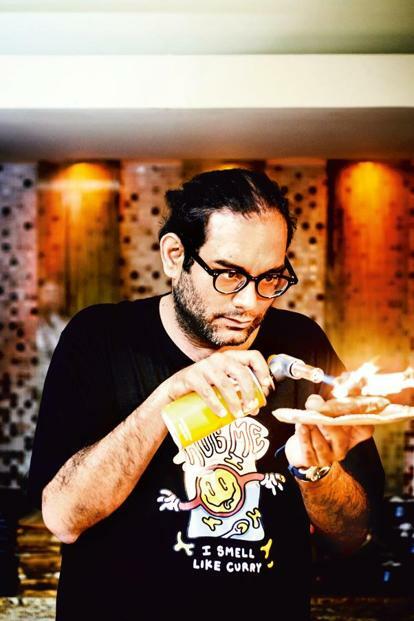 So then the question becomes: What is Gaggan Anand’s next avatar? That is the question on the minds of most as his multiple award-winning and highly feted Bangkok restaurant, Gaggan, will close in 2020. It will reopen as Raa, to be run by his head chef, Rydo Anton, with a different focus and a new menu. It will be his gift to his staff, says Anand. He will have no control over it. What are the demons pursuing him? Every restaurant chef who makes it to the top 10 has some commonalities. Cheffing is brutal business—long hours in the kitchen, finicky diners and the possibility that any of the numerous variables can go awry—so hard work is a given. Consistency of delivery is necessary, but a plethora of assistant chefs and the expeditor—staff who stand in between kitchen and dining room to make sure that the orders are perfect and filled on time—can take care of that: the final wiping of every plate before the dish gets sent out. There are a few important ingredients that take a chef to the top of the restaurant world. First on the list might well be artistic integrity. Figuring out your cooking style, both in terms of technique and value system, and then sticking to it. Refining it, yes, but also cultivating a “voice” that is unmistakable. All great chefs have a signature, whether it is the farm-to-table fanaticism of Dan Barber of New York’s Blue Hill Farm or the painstaking, yet simple-looking, layers cultivated by chefs like Daniel Humm of New York’s Eleven Madison Park, currently No.1 on the World’s 50 Best Restaurant list; or the clever wizardry of Heston Blumenthal or Grant Achatz. Anand falls in the last camp. His signature style mixes Indian cuisine with Japanese minimalism using modern food science techniques. When I ask him the one dish he would eat for the rest of his life on a deserted island, he promptly says that it is the Bengali murighonto or a rice, potato/pumpkin and fish head preparation. He ticks off his favourite Indian foods—Amritsari chhole, Kerala fish fry “in a beach shack, with fresh toddy”, Rajasthani ghevar, chaats from Uttar Pradesh, and Mysore Pak from Sri Krishna Sweets, which began in Coimbatore and now has branches everywhere. He visits India every Diwali, typically Kolkata, where his mother lives. As part of Taj’s four-city trip, Anand has taken his chefs to iconic restaurants in every city. Karim’s in Delhi (not great was the verdict), Swati Snacks in Mumbai (they loved it). In Bengaluru, the entire team raved about Karavalli at The Gateway hotel by Taj, which served, according to Anand, some of the best food he has eaten. “That raw-mango salad and ghee-roast prawns were amazing. That last dish he (chef Naren Thimmaiah of Karavalli) served with a leaf-wrap is going to influence my dishes.” The dish is called Meen Eleittad. It is fresh black pomfret with Malabar spices wrapped in a banana leaf. Perfectionism is another thing that he aims for. Like any professional or athlete at the top of his game, Anand is finicky when he wants to be. When he learns that The Taj West End serves Perrier sparkling water, he winces. “Can you please inform all our pop-ups that our official water is San Pellegrino?” he tells his publicist, Meenakshi Kumar, an erstwhile lawyer who trained in culinary school. While explaining his take on idlis, in which the batter takes on a soufflé—like lightness topped with a chutney foam, Anand stops mid-sentence and says, “Change that plate please.” He may project a casual, relaxed vibe but his eyes record everything. Adaptability is an important thing for chefs. Either they evolve and change course or die. For any business to thrive, its founders have to look to the future and change course. Chefs typically take one of the two paths. Once they have paid their dues inside the kitchen, they become businessmen like Mario Batali, Jean-Georges Vongerichten, Nobu Matsuhisa or Wolfgang Puck, opening more and more restaurants across the world.The second path is to go inward and be super-exclusive like Adrià, Jiro Ono or Magnus Nilsson, who take purity and integrity to heart. Both paths are rife with danger and the prospect of curveballs. Noma, once the world’s best restaurant, is now closed (since 2016) with the future opening in Copenhagen uncertain. The trick for Anand is to decide his path: as a restaurant magnate or minimalist? For now, he seems to be doing the former while purporting to want the latter. After closing Gaggan, he plans to open a 10-seater restaurant, GohGan, in Fukuoka, Japan. He is most excited about this collaboration with Japanese chef Takeshi “Goh” Fukuyama, whose much-awarded restaurant in Fukuoka, La Maison de la Nature Goh, is one he admires. Together, they plan to start an ultra-exclusive restaurant that will open only on weekends every alternate month. Anand also plans to open a tofu fine-dining restaurant in Bangkok. “I am supposed to do the impossible, right? Nobody in Asia has done something like this. I will kill the market.” And whet the appetites of vegetarians like me. The format is still fluid and the opening date is far away: 2021 to be precise. Currently, though, he has invested in at least five restaurant ventures, including Sühring, Gaa, Meatlicious and Wet. He opened the steak restaurant Meatlicious (also in Bangkok) with his Thai wife, Pui. He plans to open a wine bar, Wet, hopefully next year near his restaurant Gaggan, with his sommelier Vladimir Kojic, who prefers natural wines. They plan to import 35,000 bottles. When I ask Kojic what it is like to work for Anand, he says, “Things will be normal and then suddenly it will be chaos.” Predictably, chaos erupts during a lunchtime conversation when a staff member threatens to quit. “See, I told you,” says Kojic, who has seen this narrative before. Anand’s partnership with chef Garima Arora, previously with Noma and later sous chef at Gaggan, has seen many curveballs. First, her restaurant Gaa was to open in Mumbai, then it opened in Bangkok earlier this year. It serves Indian-inspired organic international cuisine and is already getting accolades. Anand has also partnered with the Sühring twin brothers (Mathias and Thomas) and their restaurant, Sühring, is already on the World’s 50 Best Restaurants list. He detests chefs who are “dishonest” with their food, by which he means chefs who are confused about what they want to cook and serve. “Spanish people eat octopus soft in a Romesco sauce. Japanese eat it hard in a takoyaki or sashimi. One needs to figure out how you want to serve your octopus,” he says. I meet Anand at The Taj West End at 11am. It is later that evening that he will preside over a 19-course meal at Masala Klub, but I am to spend the day with him. My plan is to take him to Russell Market for the photo shoot. That doesn’t go as planned. He walks out of the fish section because they are selling sharks. “I stand for sustainability and look at these guys, selling sharks,” he says. Francesca Ferreyros, his Peruvian chef, tells me how they brainstorm for new ideas. Many of their dishes are now inspired by the pop-ups they do around the world, she says. Each month, four teams have to create two dishes and bring it to Anand for testing and approval, she says. Sometimes, Anand lays out the contours of a dish. The vegetarian stew that is poured over the appamis brought in. It has cubed carrots and beans floating in coconut milk. “How about if we make granules that are the colour of these carrots and beans and pour fresh coconut milk on the table?” says Anand. And so a dish’s journey to Gaggan restaurant begins. 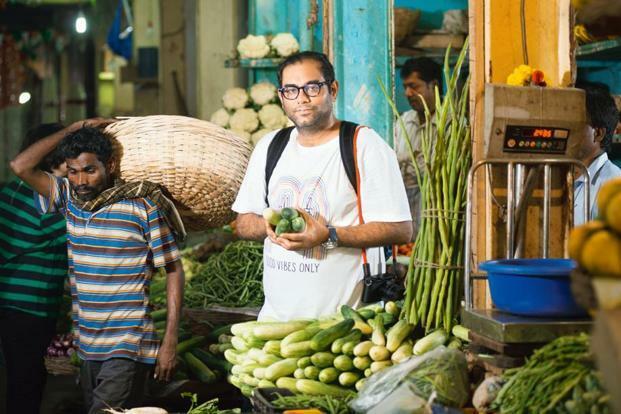 Team Gaggan travels with some 200kg of excess baggage everywhere, says Kumar, the publicist. On this visit, they worked with the Taj’s own chefs to create dining experiences that were sold out, in half an hour of being announced on email to the Taj InnerCircle members. For Anand, this is a victory lap in his homeland before he moves, perhaps permanently, or as permanently as a peripatetic chef can be, to Japan. Each Taj dinner begins with a flower and lamp ceremony. The menu cards look pretty with Anand’s signature emojis in lieu of words. There are 19 courses with many triumphant dishes and a few failures. Lick It Up, for instance, is a great concept, but for a diner to lick a plate in company is humiliating—in my view. Indians lick their fingers and hands anyway, as anyone who has tried to stop a running rasam on a banana-leaf plate knows. Anand could have fostered the sensation of eating with the hands and licking the food without subjecting his guests to this. Overall, though, the food is brilliant. A dazzling, painstakingly prepared eggplant cookie: puréed eggplant (like a bharta) squeezed into a mould in the shape of a cookie with an onion chutney jam in between. It takes “four days to make and 4 seconds to eat,” says Anand. A “charcoal” that looks like burnt wood but is made with edible bamboo, is delicious, with hints of Amritsari onion and chilli. A surprising combination of green tea with melons and tomatoes. How do you rate food? Taste, of course, but also whether it is memorable. By that standard, Anand succeeds. The memory of his dishes last long after the evening. As he shuts shop, Anand wants to leave behind another kind of memory. “Here is the scoop,” he says. On the last day of Gaggan the restaurant’s existence, Anand plans to upload all his Gaggan recipes as a free, sumptuous e-book that can be downloaded by anyone. “It will be my gift to my country and my chef community,” he says. “I may not be able to stop poverty or make India less hungry but at least I can gift my recipes to aspiring Indian chefs.” Great entrepreneurs, they say, are characterized by unrealistic ambition bordering on hubris. Is Anand a visionary or is he delusional? Is there a difference? I prefer seafood—’bhetki’ or crab. ‘Dal’. You find it everywhere—in the north and south, in the east and west. Indians have figured out fantastic, unique and regional ways of cooking ‘dal’. What food or drink from India do you miss most? Thums Up. I really miss Thums Up. Any advice for aspiring Indian chefs? Don’t cook chicken tikka masala. Respect your own ingredients. Don’t go for glamour and science. First, find your own cooking style. Who is your favourite chef or cook? Like every Indian man, I love my mom’s cooking. If you were to be born again, who would you like to be born as? I would like to be born as me, although the first 27 years were miserable. Lots of regrets. I wish I could swim, for one thing. Be a Formula One driver. I don’t have enough time for my family. I am not a good husband, good son, or good father, which is why I plan to close my restaurant in three years. Life. Travels. This trip to India will definitely influence my menu. Name two things on your bucket list? I want to drive an Italian car that sounds really good. I would love to take my entire team, all 150 of them, on a private jet and travel the world with them. What chaos that would create! Imagine putting the guy who washes dishes with some of my waitstaff who go out for poetry nights. People would change. We would learn so much. Some of them would reveal their sexuality. Who are some of the chefs that you admire? Thomas Keller, Ferran Adrià, Sriram Aylur, Manjit Singh Gill, Jiro Ono. Lots of people. Any advice for female chefs? Don’t think “I am a female”. Think that you are a chef. Chefs cook with their hands, tongues and brains, not their gender. Look at Ana Roš—she is the perfect role model for every female chef. Look at Elena Arzak. Don’t wear heels.